Orders may be pre-ordered or ordered the morning of your tour by 9:00AM. With 10 or more orders, 24 hours advance notice is required. Anyone with dietary restrictions should notify My Chauffeur and confirm their order with the individual caterer; phone # is below. If you order any sandwich, you can request the gluten-free bread. For a vegan & gluten-free option, you may order a gluten-free pizza without cheese. It is customary to purchase wine bottle(s) at the host winery to enjoy with your lunches. My Chauffeur will endeavor to maintain the menu orders and special orders agreed upon; however; meal liability agreements apply; see previous page. $3 Per Person Service Charge Applies With This Order. This fee covers preparer's gratuity, payment processing fee and service fee. Pricing below may have changed and is not guaranteed. CRAFT SANDWICHES OR THE VINTNER'S LUNCH ARE THE PERFECT MEALS! Choose from any of the assorted craft sandwiches to the left. Also available are drinks choices, kiddos choices and breakfast choices. 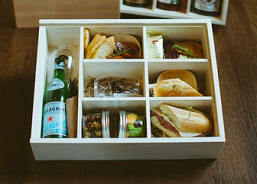 This unique locally made wooden crate is the ultimate picnic in the vineyards experience. The crate itself comes with a built-in cutting board for serving, then transforms into a 4 bottle wine carrier. The culinary treats include: house nuts with bacon & rosemary, meat & cheese plate for 2, two craft sandwiches, seasonal side deli salad, woodblock chocolate, 2 govino glasses, bottle of san pellegrino and a rhm bottle opener!